Urban islands: Both local friends and Tourism Toronto recommended the city’s Center Island when traveling with kids. I plan a family trip like I research a travel story, organizing as much as possible before setting foot on the airplane. This process looks different when traveling with children, often because my steadfast resources—favorite guidebooks, glossy magazines, my savvy travel friend’s top recs—don’t compute with half pints in tow. Sure, I can map out the must-see sites and museums, but what about the playgrounds, the child-friendly eateries, and the coffee shops where I can grab a quality cappuccino when my jet-lagged kiddo wakes up at 6 AM? These utilitarian finds are essential when traveling with kids. Here’s how I dig for these key pit stops, services, and activities in a new destination. Emergency pit stops: Thanks to tips from the Mom and Baby Madrid Facebook group, I was able to map out parks and kid-friendly finds close to our Airbnb in Central Madrid. The playgrounds were far from fancy—and some would have required a Covenant Not To Sue in the U.S.—but they did the trick. San Francisco Moms, Park Slope Parents or Central Austin Mom’s Blog. If children live in the destination where you’re traveling, I’m willing to bet there’s a family Facebook group where parents swap uber local tips. I’ve also launched the Half Pint Travel Community, a group with this exact goal—a place where parents can ask questions and share age-specific travel tips and insider destination advice—on a global scale. Before my last trip to Madrid, I joined Mom and Baby Madrid, a group of expats living in and around the Spanish capital, and asked for kid-friendly recommendations in the La Latina neighborhood, where we were staying in an Airbnb. Within days, I had enough responses to map out eateries, playgrounds, coffee shops, and activities specific to my kids’ ages. I was equally grateful for the forewarnings—dirty sidewalks, for example, a challenge with my 15-month old who will sooner eat gum off of the street than slices of prized jamon iberico. NOLA, our way: Here’s an example of my personalized map from our latest trip to New Orleans. Did I hit up all of these spots? No. But I always had an activity or restaurant close by in a pinch. Do you use My Maps by Google when you travel? I love them. 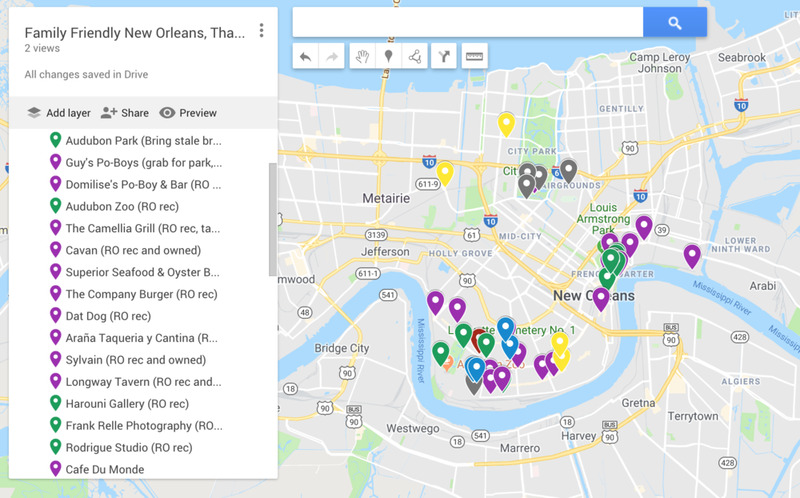 You can drop pins on specific places, organize them by color (red for restaurants, green for parks, and so on), and write notes on each locale. Along with itinerary highlights, I drop pins for pit stops such as such as coffee shops (so I can refuel) and park squares (so my kids can burn off some steam), and I always bring a paper copy in the case my phone data is slow. Even in travel writing circles, contacting friends and acquaintances for insider destination knowledge is often our first line of reporting. Don’t be afraid to reach out to your own network—you’d be surprised as to how happy people are to share their hometown secrets. Here’s the key: Contact people who have kids that are the same age as yours. And parents are especially busy people, so give them plenty of notice if you’re going to pepper them with questions. Friends recs are the best recs: Sure, Audubon Park in New Orleans is an obvious kid-friendly destination in New Orleans. But thanks to a local acquaintance, we came prepared with stale bread to feed the ducks, making this adventure even more memorable. I love Lonely Planet and the glossies I write for, but these veteran travel resources don’t always keep families with children in mind (though many are growing their family coverage, especially online). Instead, think of specialized family travel sites, blogs, and Instagram feeds that mirror your family and vacation plans. Have children with special needs? Tribe on a Quest is full of destination ideas and tips for families. Traveling with young twins? Kids Travel Library is loaded with advice for double the trouble. Best of all, you can typically ask these writers and bloggers direct questions via their social media feeds. To that end, don’t overlook the smaller teams (read: fewer followers) who likely have more time—and motivation!—to get back to you. A budding Picasso? Probably not. But this private art tour led by Made for Spain and Portugal, led by artist Carmen La Griega, was truly special. Hear the word “travel agent” and you probably think of two things: A) Someone who books airline tickets and cruises, or B) someone that holds your hand—and digs deep into your wallet—from a trip’s start to finish. Both options still exist, but there’s also a middle ground. Tour operators—these are the destination specialists that live and work in the place you are traveling—often have the best local contacts and insights. And while their excursions might be pricey, you can often hire them just for a splurge-worthy day or two. Case in point: In Spain, I worked with tour operator Made for Spain and Portugal to design a half-day excursion for our kids. They delivered an art scavenger hunt that hit up food markets and a few city sites before ending in a local artist’s studio for a private watercolor workshop. It was fantastic, and we felt like we left with a new friend who gave us a private tour of the city. The best kinds of travel advisors can create these highly local experiences, and they’re worth considering—even if they put a dent in the budget. Yes please: Sour cherry pies on Culinary Adventure Co.’s food tours were a big hit. T also tried wild blueberries, a Cuban torta, and fried squid. When reporting a story, though, I do contact the CVB for an overview of a destination and its core travel highlights. And depending on the office—and the particular representative I work with—I’m often pleasantly surprised by the quality of the recommendations I receive. Tourism Toronto, for example, has delivered on fantastic itinerary additions, from the castle-like playground in High Park to awesome food tours with Culinary Adventure Co. Washington, D.C.’s office—Destination DC—is also top notch thanks to its curious and travel savvy staff that can point you to the most surprising family friendly restaurants on the Mall (Mitsitam Cafe at the National Museum of the American Indian) as well as the best stroller-friendly sightseeing routes along the Potomac. What are your go-to resources when planning out a family vacation?